The Hoop: Partizan consider Dominic James? possibly in vain..
Partizan consider Dominic James? possibly in vain..
His performance this season hasn't gone unnoticed. Dominic James(1.80-PG) seems to be on the sights of Partizan Belgrade according to sportske.net. The Serbian portal says that James was considered during the summer as well but A.C. Law was signed instead. James was the driving force behind the team's rebirth this season and managed to turn the tide around and the team won some very important games and also qualified to the next stage of the Eurocup. James is averaging 14.2 points 2 rebounds and 4.3 assists in 13 games in Greece and also 14.7 points 2.6 rebounds and 2.3 assists in 7 games in the Eurocup at the moment attracting looks from all around Europe. He is an NBA caliber athlete although his point guard skills need some polishing up and his long range shot leaves something to be desired. It needs to be said that he has improved his long range shot and his free throw percentage this season. The Serbian portal says that James reminds them of Bo McCalebb with his ability to attack the basket and they are hoping that the financial problems of Aris will make him an easy target. Aris BC are indeed in a dire financial situation(massive debts) with no money coming in from the lack of sponsors and season tickets which is a testament to the incompetence of their administration. However the president's unofficial press representative has declared that James is not one of the players that is still awaiting late payments. 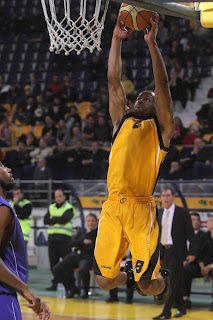 James is Aris' hottest asset and as the Greek A1 league offers no incentive of a Euroleague participation (only through the qualifying rounds and even that is not certain) he might be an asset that will be sold to the highest bidder and thus covering some of the older debts of the team. Some of them date back to season 2005-2006. So if Partizan can cough up the dough they might bag themselves James. If not then James becomes a free agent next season where he will be able to claim a much more lucrative contract than what he earns currently.